More and more companies recently are focusing their efforts on making 3D printing available to everyone through seemingly striped down printers that are difficult to get working consistently and even when you manage to do so they’re ‘ok’ in quality pretty much all the time. Though one group, 3D Systems, is drawing focus on the office space and how 3d printing is becoming more and more required for a twenty-first century business to function. With the slim pickings that most indie companies have up for offer that are open source hardware or software, there are few companies that offer everything you need. Their goals have been as a business solution, encompassing their product in every aspect from their own filament and software down to their own glue for applying to the print bed to help adherence. For better or worse, they want to be your one stop shop for everything your printer requires or that you’d ever need to operate it. The company was founded back in 1986 and is often credited with inventing 3D printing. With this they bring a ton of experience to the table not only as a juggernaut of the industry when compared to the spunky young startups of recent years but also as a developer of 3D printers with decades to hone the art of 3D printing to a consistent and reliable process. Though have they grown complacent and stagnant over the years? The only way to tell is to scrutinize them as they should have had ample time to iron out the problems and hiccups we often expect from a startup or growing business. 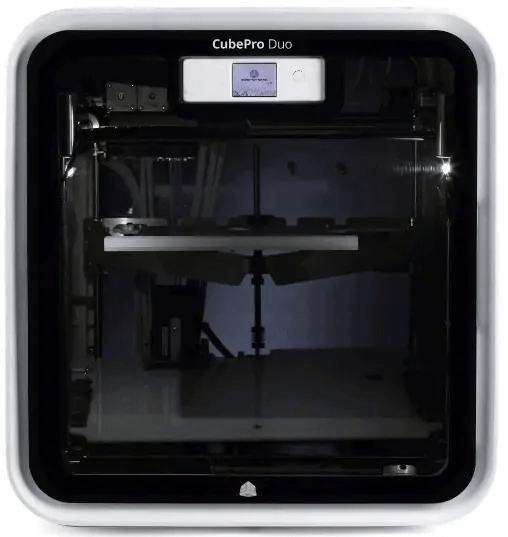 The printer we’ll be focusing on is the Cube Pro Duo, which as the name states has the neat ability to extrude from multiple extruders using different materials limited only to the varieties offered in the Cubify store ABS, PLA and Nylon. The spec sheet offered on the website leaves much to desired, and is a bad sign for the customer service side of the company. Notably left out were listings of, print speed and nozzle diameter which are rather important and a glaring error on their part. Of all the the things actually included in the documentation the build size is especially promising as it’s fairly sizable compared to some printers currently available and it still maintains high detail. Though it would be nice to see some optional features like a heated platform and an SD card reader at least it’s good that they didn’t skimp at all when it comes to print quality which should always take priority over flair and frills. Which brings us to the most disappointing thing about this printer; the proprietary filament cartridges which run you 99 USD each. The few benefits they show over standard spools is the ability to display how much filament has been used, which could be argued that you can see the filament on standard reels and gauge the same information, though more importantly they can tell the hot end of the printer what temperature they need to be for printing. Costliness seems to be a trend with this printers supposed ‘accessories’ being horribly over priced and underwhelming at best. The first of which is a replacement build platform costing 150 dollars for a platform with no features and seems to be a regular acrylic panel. other items on offer are ‘Glue Packs’ which are simply regular clear glue bottles at the laughable price of 20 dollars for two small bottles. There’s also a large disparity amongst customers that seem to either adore their unit or abhor it immensely. The majority luckily being in favor of the Cube Pro, stating it’s very reliable and can print almost all day with heavy use and producing immaculate prints, the only complaint being the proprietary cartridges which may be a reasonable trade off. Those who receive a dead on arrival printer found that customer service was horrible at worst and unhelpful at best, so tread with caution. When you actually receive your functioning printer it’s build volume and consistency are almost unparalleled, with the suite of software fulfilling all the basic functionality you’d expect from a professional company. Though it should be pointed out that the software is just that, professional, with a steeper than average learning curve and very utilitarian user interface. Setup for me was quite easy as the machine contains an on board computer for calibrations and first time setup, making the whole process very user friendly and simple. It’s more than a little disappointing to see a disregard for customers when they are what actually shape a business, regardless of all the amazing products and lofty goals, customers are what make all of it possible and I think in the time 3D Systems has let that go by the wayside too much. Forgetting that that at the end of the day if your customers aren’t happy then something needs to change. For those who received a functioning unit, they weren’t disappointed. Most owners claim that it’s a very good business grade printing allow their team to prototype, analyze, and rework their prototype effortlessly. Even people who aren’t familiar with the way 3D printers work the software is similar to that of AutoCAD and other 3D design software allow most engineers and design professionals the ease of use to switching between the softwares. This partnered with the higher capability and complexity of the program also lend themselves to professionals who don’t want the torn down and featureless programs that many of your cheaper and more home model printers use. This is a great step up and I think is a worthy selling point for this machine over the competition though I guess is a drawback to those who would need to learn the environment just to use their shiny new 3D printer. Knowing all of this, it’s safe to say you shouldn’t get this unless your whole process is able to be supported by the Cube, and its proprietary filaments. All around the Cube Pro Duo impressed, business grade, high resolution, multiple extruders for combinations of colors and materials, with a closed design for even temperature cooling severely limiting warps in the print. The drawbacks can’t be ignored though, having terrible customer service and proprietary filaments and hardware leave little room for upgradability and using new filaments that may prove to be exactly what you needed. This is all a separate issue from the price, which at over $3,000 USD is a bit more expensive than comparable models from other companies. For a good price range comparison, see this article. It’s difficult to say whether or not this printer is for everyone, but easily this is what you’ve been looking for in a relatively affordable business grade printer for your office or company, It’ll perform all day everyday reliably and has about the same maintenance as a regular 2D printer would. With the history of the company, the services they offer should be around quite a while to help you with whatever you’d need repaired or replaced for quite a while. If you’ve needed a printer to complete your array of professional prototyping and only require 2 toned prints and ABS PLA or Nylon, the CubePro Duo should suffice. I have decided to share my experience with CubePro 3d printer. I have this printer for 18 months and I have tried all variants of filament materials, that the manufacturer offers. I have printed many models but unfortunately more models where destroyed or misbuild then successfully build. The printer cannot give you what the manufacturer and salesmen’s promises to you. 1. Design – first touch is very impressive and nice. The printer design looks nice and smooth. Is completely enclosed and no moving parts are mounted outside so the cube is the only space it needs. Build chamber id lighten up und the front and rear panel is transparent so you can see your model emerging. The printer is very user friendly, the full color touch displays is intuitive and setup wizards guides the user thru maintenance and trouble shooting. The filament cartridges handling and replacement is very easy. Also the print preparation is easy. The printer comes with all tools necessary to maintain it. But this is all what the printer offers on positive side. 2. User software – software is very user friendly and easy to use, but it is very buggy. It crashes for no reason. When you try to customize the build options the software is not able to create support for models on edges and ignores the sidewalk options and perforation. The same happens when you enable the fine detail options. And also if you move your models on build platform the software is not able to create the build program and crashes. When you leave all in default settings it works fine, but the default option is suitable only for small and easy models. On bigger and more detailed models you need to adjust this setting or you will see how the printer wastes tons of material or the model is misbuilded. The software updates come out very often, but the major bugs are not fixed, mostly new features are added. I don’t know what the software engineers or testers do that they don’t find this bugs. I have the feeling that they just ignore bug reports. 3. Firmware – the firmware for model building is very buggy. The print algorithm causes sometimes collisions especially when you have more than one model of different shape or color. Ones the collision was so bad that it damaged one of the print heads. When the printer pauses the print for layer cooling and hardening a small amount of filament comes out of nozzle and instead to clean the head (the printer is equipped with very nice cleaning mechanism with waste bin) the printer continues to print and damages the model, so you have to post process the model with sandpaper or knife or you throw the model away and build it again and you hope that this time it will be not that bad. 4. Mechanics – the mechanics is designed on strong chassis with very good solution for y-axis (it uses two step motors) the mechanics is well prepared to handle motions dynamics. The cabling and filament guide pipes are installed in very professional way. The problems are the sliding bearings which are pure quality and they causing movement jams and noises. This leads to model misbuilding by shifting of layers. The electronics causes also trouble. My printer was in service center twice for both problems, but they replaced only the mainboard (twice) the sliding guides are still the original ones installed in factory and causing still the same problems. The filament feeder mechanism is good but too precise for the poor quality of the filament string. This causes the user to disassembly the mechanism and clear it every time when a jam occurs (what is in most abs filament very often). This procedure is time and patience consuming. 5. Filament cartridges – oh yeah, the biggest problem for this printer. At first I liked the idea that the cartridges are equipped with ID chip which provides all the necessary info for the printer what type and color of material is inserted, but this is not the main role of this chip (you can do this with barcode is cheaper than the chip), the main role is to ensure that you use the genuine cartridges provided by 3ds! This should be not the issue if the price is fair for the quality and material amount. Chips are faulty and sometimes new cartridge is not recognized. There is only 680g of material and the string miserable quality for 99 Euro. I have tried all types of materials and many colors. ABS – the worst material. Avoid it at any cost. Especially the red one. Strings has too many defects and causing filament jam! The printer build platform cannot handle the ABS shrink properties and it gets bended or the first layer is fused into platform. The print algorithm for this material cannot compensate for abs material properties and the printed models look terrible. Big models are NO GO for abs! PLA – this is the right material for this printer. The models are good, no shape shifting, good surface quality. The problem is only, when the filament is in printer for more than 3 weeks, the string starts to crack in guide pipes, what leads to filament jam in print head. To get the filament then out of guide pipe is not an easy task. When the string cracks near the entrance of the cartridge, it is pulled inside and you have no option but to open the cartridge and get the string back to where it belongs and of course you lose the warranty to this cartridge. NYLON – very strong and good material, but the printer cannot handle it. When the print is paused for layer hardening, the filament is overheated and you see burn mark in model and of course the filament comes out during this pause and the printer do not clear the head and destroys the model! Interesting is also the fact that you cannot configure the printer software to use different materials when nylon option is used for other print heads. So when you want to use different material then nylon you have every time to reconfigure your print software. 7. Service and support – the onsite technician which has done the service for my printer has done his best. His hands were in many cases tighten by manufacturers service contract. All troubles have to be verified by manufacturers tech support and they didn’t listen to problem descriptions provided by customer. They wanted photos and videos, so I did my best to satisfy their needs to make proper analyses of my printer’s issues. But in the end they ignored everything and send me stupid instructions that never solved the issue. My printer has mechanical problem proved by video and they told me to update firmware. Of course it didn’t solve the problem, only expensive filament was wasted on next model. In the end the motherboard quitted and the printer was taken to service center for repair. I waited 3-4 weeks for its return and they of course changed the mainboard for a one with defective usb port, so the service center has to wait for another new mainboard again. After return the mechanical problem is still present. They give me of course advise to lubricate the faulty bearings regularly. Cool idea to lubricate those bearings when the bearing manufacturer forbids this, because dust is collected in this lubricant and this dust mix is pulled inside those bearings and they get slowly damaged. So now I’m waiting for total failure of those bearing. Software issues are ignored by default at support. Filament and spear parts supply is short and it takes weeks to get it. Final assessment – the idea of user friendly 3d printer is very good and this printer has mastered most of this idea good. But the philosophy to get huge money from customer for cartridges is a gall. The printer is not able to print what the manufacturer promises. The support is ignorant and incompetent. The printer is not worth its price. You will be very fast disappointed. I regret this purchase. There are better printers on the market that this one. They are cheaper, maybe uglier and more skills are necessary to operate them, but you will get the expected output from it. This printer is pure waste of money. Maybe another manufacturer will inspire their products by the philosophy of user friendliness, case design and software interface. Epic share! Thanks Daniel. I’m sure this will help others out. Need repair of Cubeduo duo need filament path cleaned. Do you supply repairs.